BRIDGETOWN - Three earthquakes occurred in the Caribbean between last night and early this morning, with residents of several islands reporting feeling the tremors. According to the Trinidad-based Seismic Research Centre (SRC), the quakes struck over a six-hour period overnight. The first the SRC recorded occurred at 9 p.m.— a 4.0 magnitude earthquake that was recorded 224 km east northeast of Point-à-Pitre, Guadeloupe; 255 km east of St John’s, Antigua and Barbuda; and 257 km northeast of Roseau, Dominica. Then, 17 minutes later, an earthquake with a magnitude of 3.9 shook Dominica. 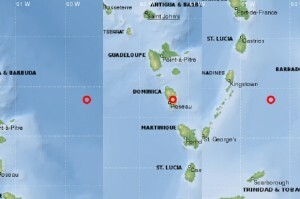 That one occurred 11 km northeast of the island’s capital, Roseau; 89 km north northwest of Fort-de-France, Martinique; and 100 km south southeast of Point-à-Pitre, Guadeloupe. The third quake – another 4.0 magnitude tremor – struck near Barbados. It was 94 km southwest of the capital, Bridgetown; 102 km southeast of Kingstown, St Vincent and the Grenadines; and 153 km southeast of Castries, St Lucia. Although residents, particularly in Dominica, went to the SRC’s Facebook page to say they felt the tremors, there were no reports of damage or injuries.